Here I'll start by writing about how the manners of the Japanese are no so bad in comparison to those of foreigners. I heard this from someone who works in a hotel. There is a clear difference between Japanese and foreign guests after they have finished with a room. Japanese guests put the sheets and futon back into shape, and also clean up the wash basin. In the case of refuse　(rubbish/trash) too, when there are two bins one for burnable and another for non-burnable refuse, Japanese guests tend to separate their refuse into the appropriate bin. By comparison foreign guests tend not to clean up after themselves, and leave their rooms in quite a state." (Funahashi, 2008, p166, my translation). 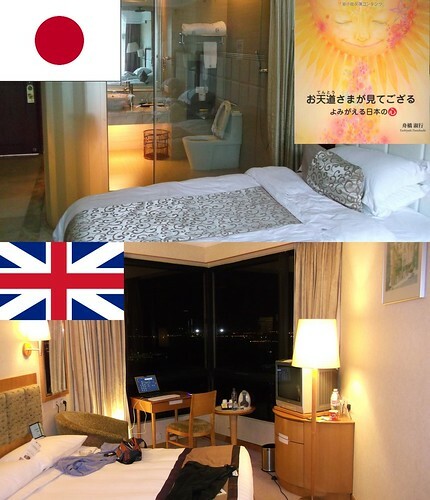 I have used a British flag on the lower messier picture of a hotel room merely for illustrative purposes. The text groups all non-Japanese into one category of "foreigners". My guess is that there may be hotel guests from nations other than Japan, who also leave their rooms in a similarly neat and tidy way. I confess, however, it would hardly cross my mind to clean up my hotel room before departure. Part of the joy of staying in a hotel room is that I am able to leave the cleaning to someone else. Sometimes to save the cleaning staff work, I leave one of those dongles on the doorknob to tell the cleaners not to bother to clean up today. But often I make use of the service, considering it part of the luxury that I am paying for. The kindness of the Japanese in cleaning up their hotel rooms after they leave may appear almost neurotic to British eyes. The reason for this behaviour lies in title of the book from which the above extract was taken. The Japanese live in the sight of the kind old Sun. That is to say, their ancestors and spirits, their soul, watches and protects. It is from this visual perspective that Japanese evaluate themselves so their mess can not be rationalised ("it is part of the luxury", "I am paying for it") away. To the Japanese "impurity" or mess is mess and has to be cleared up by someone. So, seeing this, and seeing it is not beautiful, Japanese guests make the situation beautiful themselves. The above is just as the author goes on to conclude. To the Japanese author, "Dirty appearances are the sign of a dirty heart" (見た目の汚れは心の汚れの現われです. p173). Before the notion of "morality" had been invented, when people of old went to do something that was bad, or something that they'd regret, they felt "the kind old sun is watching" and controlled themselves and censured others. Eat your heart out Ruth Benedict (1946/2006)! This is just the sort of quote I was looking for because it takes place in the privacy of a hotel room. The mess, or rather its absence, will not be seen in many cases until after the guest has left and is walking down the street, never to stay at that hotel again. And yet, even in the absence of all external censure, the Japanese guest will often have cleaned up their room, whereas I will have whispered some rationalisation to myself and left my room in a state like the aftermath of a fraternity party. Britons have aspects which are "not so bad" either. Having checked out of my room I may be slightly more inclined to leave a nice long verbal review of my hotel room, and this book, since this is the sort of evaluation that my logocentric, narrative self encourages me to do. In both cases good and bad behaviour is not about external censure but about conscience, and the nature of the self. 舟橋淑行. (2008). お天道さまが見てござる―よみがえる日本の心. 東京: 明窓出版. It would be good to do a quantitative survey.